Bring water and sugar to a boil in small saucepan, stirring occasionally, until sugar is dissolved, 5 to 10 minutes. Remove saucepan from heat and stir in raspberries. Mash mixture using a potato masher or fork. Let mixture steep for at least 1 hour. Drain mixture through a fine mesh strainer, pressing raspberry pulp with a spatula to extract as much liquid as possible. Discard solids and store syrup in a sealed container in the refrigerator. Bright, ruby red and delicious! See how to make this tangy drink flavoring. 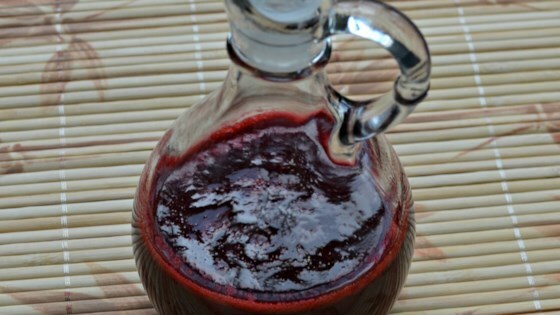 If using frozen berries, add them while the syrup is on the burner. Return syrup and frozen berries to a boil; remove from heat, mash, and let steep as directed in the recipe. Multiplied due to 5 cups of raspberry sauce. Came out pretty runny. Should have cooked longer to thicken. I used frozen raspberries, and it turned out perfect! Thanks! Used this recipe to make Raspberry Bellinis for a brunch (Presecco, Raspberry vodka and this syrup). Easy to make and delicious. Great recipe for making one of my favorite cocktails - Raspberry Limoncello Martinis. I keep frozen raspberries on hand so I can make this at any time. Thanks for posting! I added a little more sugar and a few drops of lemon juice. It’s delicious!